Cebu’s Sinulog Festival deserves a feast just as grand and Marco Polo Plaza Cebu obliges with the culinary experience “Sugbusog 2018: Gikan sa Bukid ug Dagat” at Cafe Marco. Up until January 21, indulge in such local favorites as kinilaw na isda, puso sa saging, lato, and guto; ginamos and sinugba na buwad; manggang hilaw with hipon; monggos, humba and kaldereta na kanding; lechon belly and lechon kawali; inasal na manok and other Cebuano dishes raised to the level of a fine dining experience at Cebu City’s finest. STARTERS. From chicharon or pork cracklings to itlog maalat salad, paliya salad, and manggang hilaw, Sugbusog 2018 at Cafe Marco in Marco Polo Plaza Cebu is a feast of Cebuano favorites. Have your fill of Cebu street food like qwek-qwek, ginabot, ngohiong, balot and the local sweet staples for dessert. The Cafe Marco dessert station carries such delicacies as masareal, bokayo, leche flan, pichi-pichi, puto cheese, masi, kutsinta, and of course halo-halo. Satisfy your craving for seafood like saang, pasayan, and sinugba na isda throughout Sugbusog 2018, which runs from January 12-21 at Cafe Marco. The Cebuano favorites are served on top of the regular international buffet spread at Cafe Marco. 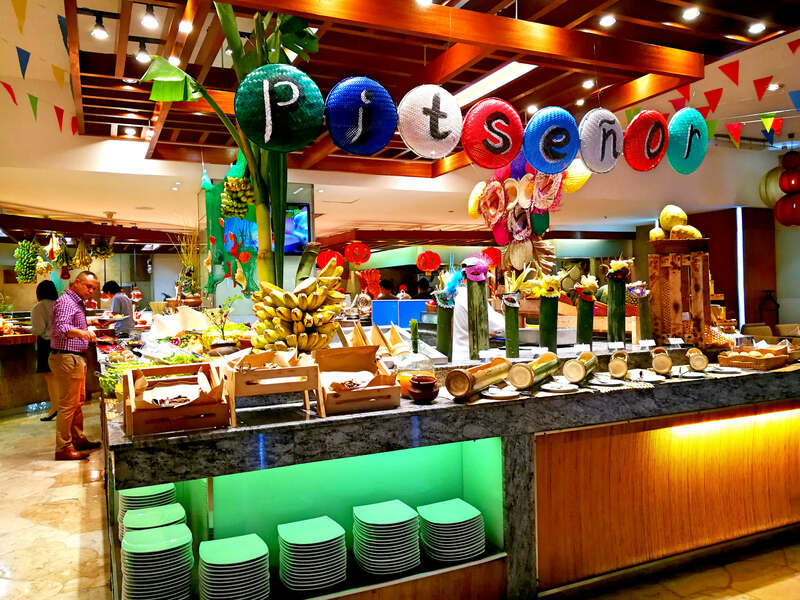 Buffet prices are P1,150 net for lunch, P1,440 net for dinner, and P1,450 net for Sunday brunch. The Sinulog-inspired decorations and creative food presentation add to the rich festival atmosphere at Cafe Marco and the rest of Marco Polo Plaza Cebu. A replica of the popular Cebu attraction Magellan’s Cross with a Sto. Niño inside now decorates the hotel lobby. Sto. Niño patrons Helen Ynclino-Bucag, Val San Diego, Ben Chua, Ed Tan, and Josie Pereyra have loaned out their Sto. Niño image collections for exhibit at Marco Polo Cebu. For inquiries and reservations, contact Marco Polo Plaza Cebu at +63 32 2531111 local 8249 or [email protected]. SUGBUSOG 2018. The culinary festival at Cafe Marco in Marco Polo Plaza Cebu runs until January 21. Saang and other sea shells. Inasal na manok and piniritong tiil sa baboy. Tinunuon nga monggos with alugbati. STREET FOOD MAINSTAYS qwek-qwek, bola-bola, ngohiong, and ginabot. Buwad nukos or dried squid. Bocayo and ampao from Carcar. LOBBY. A replica of the Magellan’s Cross greets guests at the Marco Polo Plaza Cebu lobby. STO. NIÑO. One of the images on exhibit at the lobby.